A lot of the blogs I read are talking about the change of season and how it is energising them to get their knit back on. I don’t think that I have been knitting for long enough to notice how the seasons affect my knitting. I have had lulls and surges in knitting activity, but that seems (so far) to be more to do with what is going on in the rest of my life rather than any kind of regular pattern. That was put on hold a while ago when my first Three Irish Girls shipment came. The yarn was so scrummy that I had to cast on immediately. I decided to use the pattern that came with the club, but I am having regrets now as the busyness of the yarn overwhelms the pattern. 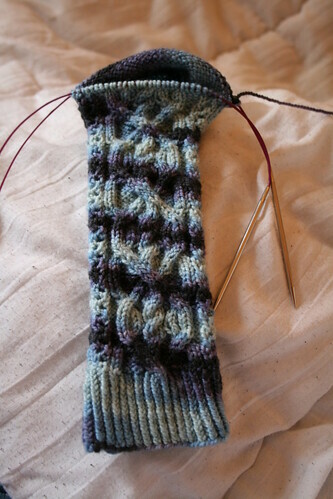 I am through the heel and gusset of the first sock, but I haven’t worked on it for a while. The beckon yarn base is just fantastic to work with. It is quite tightly spun and yet so squooshy. I am not sure how well it will wear, being 100% superwash merino but I have never worn any of the socks that I have knit so far, so I am not really worried about that! I also picked up one of the Sock Madness socks again (after a break of I don’t know how long) to knit my first ever Japanese short row heel. I had tried it a couple of times before, probably when I was quite tired, and didn’t get the hang of it and ripped it back. This time I managed it, and it was fun. There are still holes that I can see, but maybe with practice I would be able to change that. 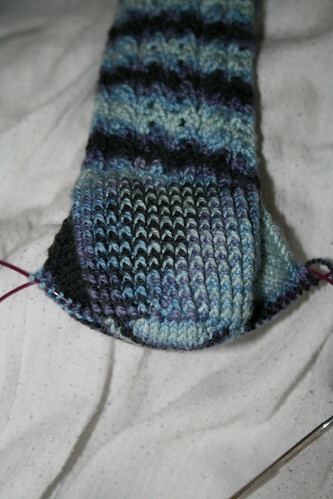 I have only done the one heel so far. I will do the other one soon so that I can finish the socks and free up a pair of size 2 needles. I have been holding off on casting on any more socks until the ones on the needles are finished. The problem with short rows is that each time you turn your knitting to work in the other direction, a small hole appears at the turn. A regular short row heel gets around this by wrapping the stitch at the turning point with the working yarn. The wrapped stitches are left on the needle as fewer and fewer stitches are worked on (working towards the point of a triangle, the wrapped stitches are the wider sides). At the point when the number of working stitches is narrow enough for the heel of your foot, you start knitting back into the wrapped stitches one by one, which brings the knitting round the heel. As you get to a wrapped stitch, you pick up the wrap and place it on the needle which reduces the appearance of holes. A Japanese short row doesn’t have any wraps. 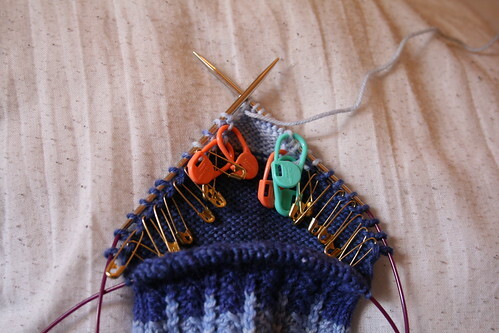 Instead a safety pin is attached to the working yarn at the point where the knitting is turned and when you return to that stitch, the pin is used to pull the yarn onto the needle (and then removed – it would be uncomfortable to walk on all those pins) and is knit together with the stitch. It sounds complicated, and it can be if you are used to wrapping. But it is actually a really nice way to close the holes up.